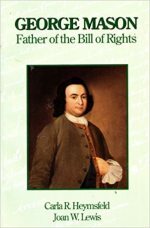 George Mason is known, together with James Madison, as the “Father of the Bill of Rights.” However, George Mason would be better named the “Grandfather of the Bill of Rights” since the basis for the Bill of Rights to the U.S. Constitution was the Virginia Declaration of Rights. That all men are born equally free and independant, and have certain inherent natural rights,… among which are the Enjoyment of Life and Liberty, with the Means of acquiring and possessing Property, and pursueing and obtaining Happiness and Safety. George Mason, Virginia Declaration of Rights, May, 1776. Virginia’s Declaration of Rights was drawn upon by Thomas Jefferson for the opening paragraphs of the Declaration of Independence. It was widely copied by the other colonies and became the basis of the Bill of Rights. 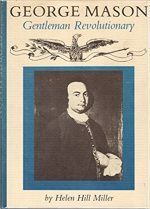 Written by George Mason in May 1776, and amended by Thomas Ludwell Lee and the Virginia Convention, it was adopted by the Virginia Constitutional Convention on June 12, 1776. 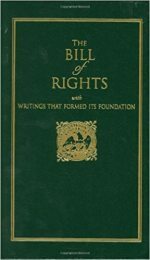 This uniquely influential document was also used by James Madison in drawing up the Bill of Rights in 1789. 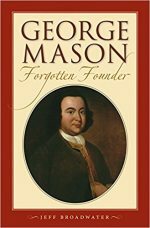 George Mason, for whom [George Mason University] is named, was one of the greatest of the founding fathers of the United States. 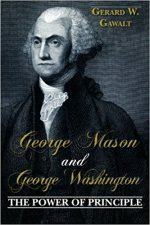 Mason drafted the Virginia Declaration of Rights, which became a model for the first 10 amendments to the U.S. Constitution, known as the Bill of Rights. 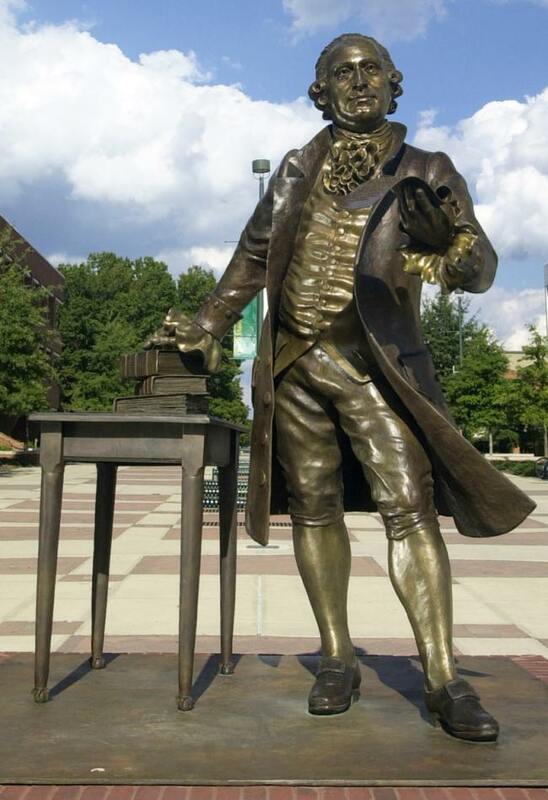 Perhaps the most well-known landmark on the Fairfax Campus [of George Mason University], the George Mason Bronze is located between the Johnson Center and the Performing Arts Building. Created by internationally known artist Wendy M. Ross, it is the first three-dimensional portrait of George Mason in the United States. Seven feet tall, the statue portrays the great statesman presenting his handwritten first draft of the Virginia Declaration of Rights. 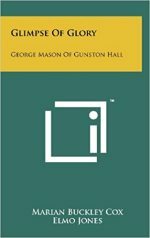 The writing table on Mason’s right replicates the original, which can be found in the study at Gunston Hall, his home in Fairfax County, Virginia. The three books on the table–works by Hume, Locke, and Rousseau–depict the sources of his thoughts on individual liberty. The statue is a constant reminder of the ideals most important to both the man and the university: freedom and learning. 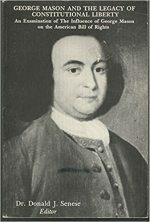 George Mason wrote the first draft of The Virginia Declaration of Rights in May 1776. 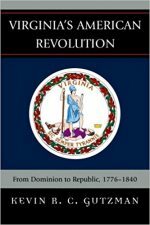 The Virginia Convention met in Williamsburg on May 6, 1776, and by May 15th had passed a resolution calling for the Virginia delegates at the Continental Congress to move for independence. At the same time they formed a committee for drafting a bill of rights and a constitution for Virginia. 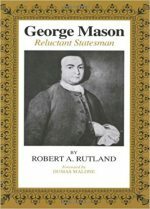 George Mason took the lead on this project and his notes below are considered the first draft. To this draft eight additional propositions were added by the committee before it was read to the Convention on May 27, 1776. After debate, and several changes, the Declaration of Rights was passed unanimously on June 11, 1776. A DECLARATION OF RIGHTS made by the representatives of the good people of Virginia, assembled in full and free convention which rights do pertain to them and their posterity, as the basis and foundation of government . Section 4. That no man, or set of men, is entitled to exclusive or separate emoluments or privileges from the community, but in consideration of public services; which, nor being descendible, neither ought the offices of magistrate, legislator, or judge to be hereditary. Section 5. 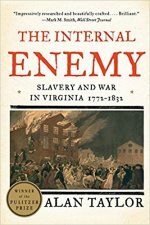 That the legislative and executive powers of the state should be separate and distinct from the judiciary; and that the members of the two first may be restrained from oppression, by feeling and participating the burdens of the people, they should, at fixed periods, be reduced to a private station, return into that body from which they were originally taken, and the vacancies be supplied by frequent, certain, and regular elections, in which all, or any part, of the former members, to be again eligible, or ineligible, as the laws shall direct. Section 6. That elections of members to serve as representatives of the people, in assembly ought to be free; and that all men, having sufficient evidence of permanent common interest with, and attachment to, the community, have the right of suffrage and cannot be taxed or deprived of their property for public uses without their own consent or that of their representatives so elected, nor bound by any law to which they have not, in like manner, assembled for the public good. Section 7. That all power of suspending laws, or the execution of laws, by any authority, without consent of the representatives of the people, is injurious to their rights and ought not to be exercised. Section 8. That in all capital or criminal prosecutions a man has a right to demand the cause and nature of his accusation, to be confronted with the accusers and witnesses, to call for evidence in his favor, and to a speedy trial by an impartial jury of twelve men of his vicinage, without whose unanimous consent he cannot be found guilty; nor can he be compelled to give evidence against himself; that no man be deprived of his liberty except by the law of the land or the judgment of his peers. Section 9. That excessive bail ought not to be required, nor excessive fines imposed, nor cruel and unusual punishments inflicted. Section 10. That general warrants, whereby an officer or messenger may be commanded to search suspected places without evidence of a fact committed, or to seize any person or persons not named, or whose offense is not particularly described and supported by evidence, are grievous and oppressive and ought not to be granted. Section 11. That in controversies respecting property, and in suits between man and man, the ancient trial by jury is preferable to any other and ought to be held sacred. Section 12. That the freedom of the press is one of the great bulwarks of liberty, and can never be restrained but by despotic governments. Section 13. That a well-regulated militia, composed of the body of the people, trained to arms, is the proper, natural, and safe defense of a free state; that standing armies, in time of peace, should be avoided as dangerous to liberty; and that in all cases the military should be under strict subordination to, and governed by, the civil power. Section 14. 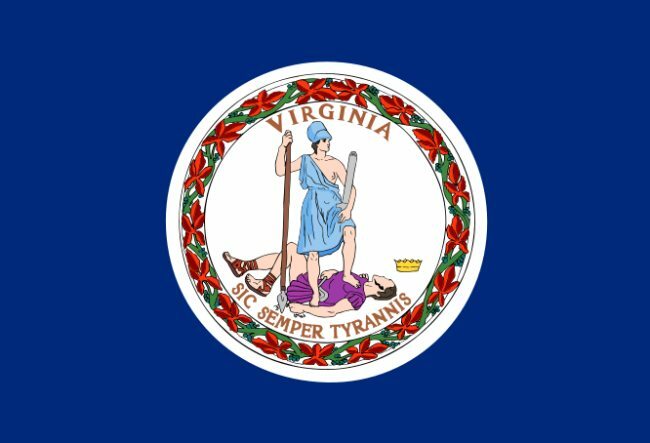 That the people have a right to uniform government; and, therefore, that no government separate from or independent of the government of Virginia ought to be erected or established within the limits thereof. Section 15. That no free government, or the blessings of liberty, can be preserved to any people but by a firm adherence to justice, moderation, temperance, frugality, and virtue and by frequent recurrence to fundamental principles. Section 16. That religion, or the duty which we owe to our Creator, and the manner of discharging it, can be directed only by reason and conviction, not by force or violence; and therefore all men are equally entitled to the free exercise of religion, according to the dictates of conscience; and that it is the mutual duty of all to practise Christian forbearance, love, and charity toward each other. 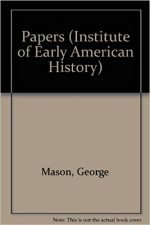 “The federal and state constitutions, colonial charters, and other organic laws of the United States,” by Benjamin Perley Poore. Washington: Government Printing Office, 1878, pages 1908-1909. 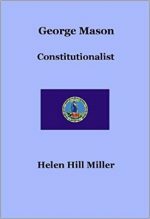 The current Virginia Constitution and Bill of Rights is found here. General Warrants, NSA Spying, And America’s Unappreciated Founding Father, James Otis, Jr.